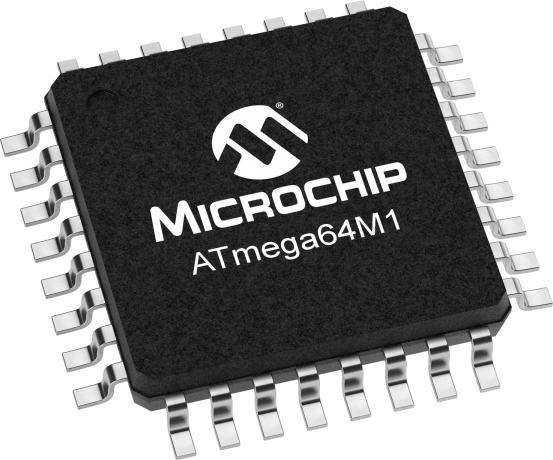 The high-performance, low-power Microchip 8-bit AVR RISC-based microcontroller combines 64KB ISP flash memory with read-while-write capabilities, 2KB EEPROM, 4KB SRAM, 27 general purpose I/O lines, 32 general purpose working registers, one motor power stage controller, two flexible timer/counters with compare modes and PWM, one UART with HW LIN, an 11-channel 10-bit A/D converter with two differential programmable gain input stages, a 10-bit D/A converter, a programmable watchdog timer with internal individual oscillator, SPI serial port, an on-chip debug system, and four software selectable power saving modes. The device operates between 2.7-5.5 volts. The XPRO-Shield Adapter enables Xplained Pro boards to be interfaced with standard Arduino shields. The Debug Adapter Shield leverages a user to program and debug Arduino boards using IDEs like Studio with -ICE and JTAGICE3. The ATSTK521 board is a hardware expansion module for the STK500 Starter Kit. It adds support for the AVR 20-pin AT90PWM81 device. The STK521 includes connectors, jumpers allowing full support for all features on the AT90PWM81. STK600 socket card for 64-pins QFN 0.5 mm pitch devices. Supplements the STK600 Starter Kit.